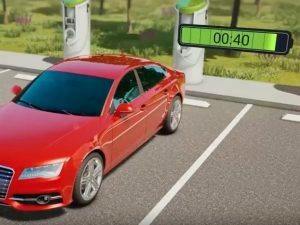 Electric vehicles with a 300-mile range and five-minute charging times could reach the market within three years, following a breakthrough in battery technology. StoreDot claims five-minute full charges, with a range of 300 miles. StoreDot, a nanotechnology materials company based in Israel, has developed an organic substitute for the graphite cathode used in most lithium-ion battery cells – the component which limits energy conductivity, in turn affecting the amount of energy it can store, and the durability of the unit itself. The FlashBattery uses a material which has much higher combustion temperatures, thus reducing resistance to enable faster charging times, but also improving the safety of the battery, the company said. StoreDot expects it to be integrated into production vehicles within three years.